We Make It. We Sell It. We Drink It. You can buy our products at our distillery in Ottawa Kansas. Buck-U was founded in January 2016 . 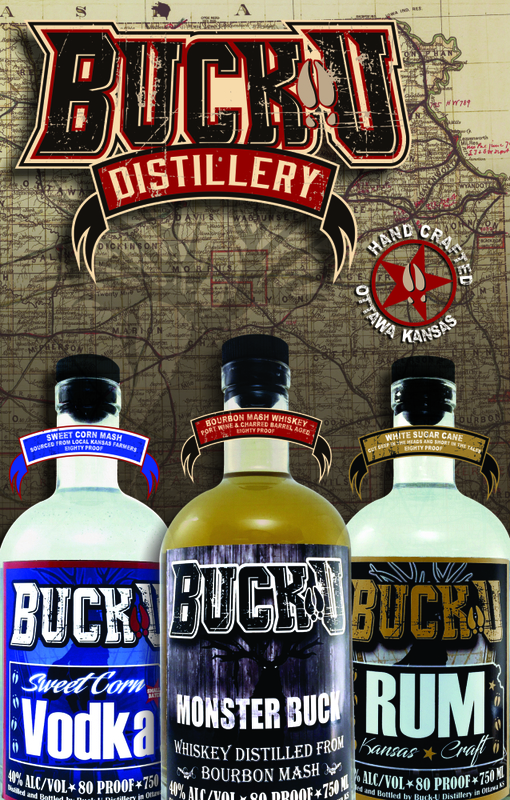 The company started as Monster Buck distillery but was later changed to Buck-U distillery. We have been producing spirits in our distillery since our license became active in 2017. We hope to produce many brands and classes of spirits from locally crafted Kansas fruits and grains. We are a small batch craft distillery that make the cleanest spirits in the world. We chose Ottawa because its centrally located to our families and because it retains the small town midwestern values that are central to our company success. We hope you enjoy our spirits as each batch is hand made by master distiller Daryl Kleitz. We strive to create a spirit that is distinguished by its unique style and flavor created by our local fruits and grains. Buck-U provides free samples and you can purchase our products at our distillery. We also sell merchandise. Stop in for a unique moonshine tasting experience and see what our latest test product is..
Buck-U can custom distill your beer or wine into a fine whiskey or brandy. Contact us for a wholesale price on custom distilling. Buck-U can bring Spirit to your event or party. Contact us to see how we can make your event one of a kind.